Hello and welcome back for Day 4 of our 12 Days of Christmas review series! Days 1 through 3 have brought warm fuzzies to all of us here at ItsJustAwesome.com so far, as we’ve happily strolled down memory lane to talk about some of the most well-loved Christmas classics of all time. Today, I’m sorry to inform you, a dramatic shift is taking place. To say that today’s movie is NOT a classic is perhaps the greatest understatement in the history of recorded speech–it’s a movie that is so awful, there’s no way to even begin to describe what’s so awful about it. 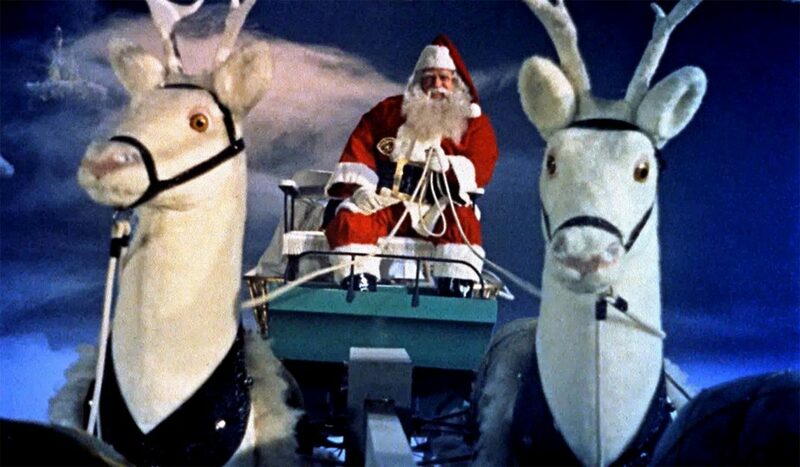 Santa Claus (1959), directed by Rene Cardona, is quite possibly the worst movie ever made. It has 2.4 stars on IMDb…NOT EVEN TWO AND A HALF STARS, people! We are morbidly, unaccountably obsessed with it at IJA, and have cried tears of mirth (on more than one occasion) while discussing it on our podcast. As such, I thought we could escape its siren call this year, but alas, I drew the short straw and it looks like the task of finding a way to review it in a written format shall fall to me. It’s…I…I legitimately don’t know where to start. Santa is an alien? He’s friends with Merlin? There’s a lactose-intolerant demon named Pitch who is trying to thwart Santa by corrupting the children of Mexico City? You tell me. I guess we’ll start with the basics. This was originally a Spanish language film, but the copy we’ve all seen at IJA is the dubbed-over English version. I’m not sure if the producers didn’t quite have the budget to pull it off, or if they just didn’t care about the English version enough to devote more time to its creation, but the result is laughably absurd. The horrible dubbing and bizarre voiceovers work in tandem to set an incredibly low bar, right from the opening sequence (which, by the way, is a ten minute head-scratcher of Santa just pumping his arms up and down on the organ and listing the countries of the world). On top of the hashed-together quality, the storyline makes NO SENSE. In this version of the Santa legend, Saint Nick isn’t a magical human or an elf, but is instead a festive, jolly alien who spends 364 days a year circling the planet in his wintry spacecraft. He also has several helper children aboard the ship, all from different and specifically-mentioned countries, but then later we start to wonder if they might actually be aliens as well (they have no idea what Earth customs are or what humans eat). Basically, the story boasts more plot holes than I would have thought possible for a movie that made it all the way through production, and it’s kind of hilarious how glaring most of them are. If we were to discuss all the gaps and oddities in detail here, however, this review would be 78 pages long. So, I guess I will refrain. But…wow. Santa’s main mission throughout this gem of a film is, of course, to fly down to Earth on Christmas via his animatronic reindeer sled. In addition to these creeptastic deer-bots that he winds up with The World’s Largest Key, Santa has a few other tricks up his sleeve as well. Courtesy of his friend Merlin the magician (?! ), Santa can harness the powers of an Invisibility Flower, some Dream Dust, and a vibrating, waistline-reducing, workout belt that I can only assume he or Merlin bought from a space infomercial at 3 a.m. Seriously. All of these things are real in the movie. Unfortunately for Santa, his gift delivery process is impeded by the antics of Pitch–one of Satan’s minions, who has been threatened with chocolate ice cream if he fails to corrupt enough children to keep Santa from giving out presents (yep, that’s real also). It’s a weird, awful, train wreck of a movie. Oddly enough, I think Santa Claus would have made a better stage production. It reminds me in many ways of a nightmarish Nutcracker ballet, and I wonder what could have been done to that end with the right director and budget. The costumes (Pitch is dressed in a spandex/Shakespearean pantaloon combo throughout), the song and dance numbers, and the theatrics in general all lend themselves much more to a ballet than a film, if you ask me. It will probably never happen, and it likely shouldn’t, but if Santa Claus ever DID make it to the stage…I have to say, I’d be intrigued. Hamilton happened, so the sky is apparently the limit with what can be successful on Broadway! Tomorrow, be sure to join Micah for Day 5 of the 12 Days of Christmas series, as he reviews A Charlie Brown Christmas (1965). Now that we’ve gotten Santa Claus out of the way, things can only go up from here! !